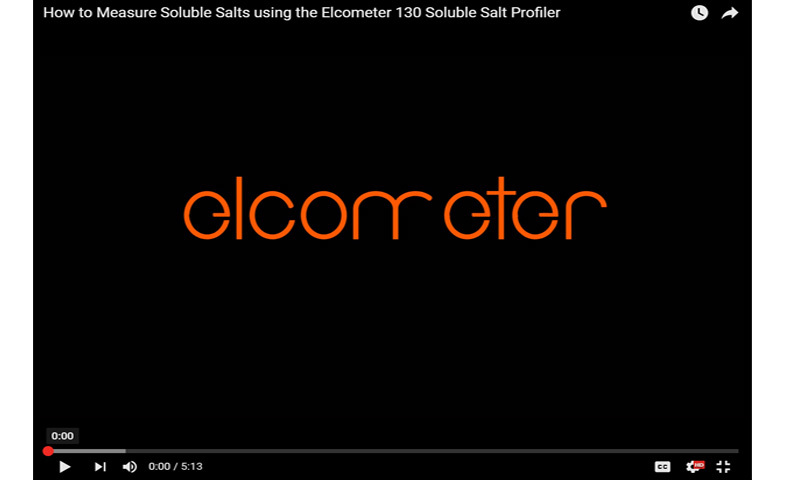 The Elcometer 130 Soluble Salt Profiler provides fast and accurate measurement of the level and density of soluble salts - over 4 times faster than other Bresle equivalent methods. The new Elcometer 130 Soluble Salt Profiler allows you to complete a Bresle equivalent test in just over two minutes. he multi-point conductivity sensors enable the Elcometer 130 SSP to accurately display salt concentration, showing exactly where the contamination lies and generating full colour salt density maps in 2D or 3D. The Elcometer 130 quickly and accurately measures the level of soluble salts on surfaces nearly 5 times faster than Bresle equivalent test methods. The Elcometer 135A & 135B Bresle Patches are used to determine surface chloride contamination. The Elcometer 135A Bresle Sampler is a self-adhesive rubber film patch with a sealed compartment for sampling of soluble impurities from steel surfaces with a suitable solvent. The Elcometer 135A Bresle Samplers are also part of the Elcometer 138/2 Surface Contamination Kit. Elcometer 135B Bresle Patches are used to determine surface chloride contamination and are self-adhesive rubber film patches with a sealed compartment for sampling soluble impurities from steel surfaces with a suitable solvent. Elcometer Bresle Patches are also available as part of the Elcometer 138 Bresle Salt Kit. Users can either place a sample on the conductivity meters flat sensor or immerse the meters sensor directly into the solution under test. The Elcometer 138 Conductivity Meter can be used for a broad range of applications, including: soluable salt concentrations, the electric conductivity (EC) of solutions used in agricultural operations and measuring rainwater pollution levels. Measuring the level of contaminants on a surface prior to application of the coating is essential to ensure the quality of the coating and that its optimum lifetime is achieved. Results are recorded in parts per million (ppm) requiring no complicated calculations. Elcometer 134 CSN tests are all designed to use a ratio of 1:1 for easy conversation to to �g/cm�. The Elcometer 139 Amine Blush Swab Test Kit is a rapid colorimetric test designed solely for the use in the quick and immediate qualitative identification of amine blush (carbamates) on the surface of coatings using surface swabs. The presence of amine blush is indicated by a visual change of colour of the test solution when compared with a control sample. The Elcometer 139 Amine Blush Chip Screen Test Kit is a rapid colorimetric test designed solely for the use in the quick and immediate qualitative identification of amine blush (carbamates) on the surface of coatings using small chips or shavings. The presence of amine blush is indicated by a visual change of colour of the test solution when compared with a control sample. The Elcometer 139 determines whether amine blush is or is not present on the coating�s surface.